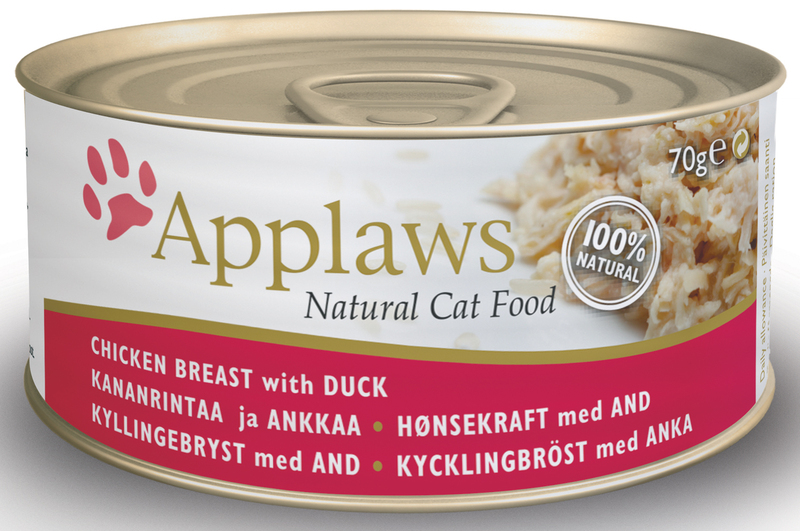 Applaws Natural Chicken Breast with Duck is a Complimentary food for adult cats. It contains 100% natural and simple ingredients to provide your cat with the diet that nature intended. There are no additives, colours, flavours or taste enhancers. The chicken breast used is of the highest quality and is cooked in its own juices for added natural flavour. The chickens are fed on pure organic feed and are hormone free. Below are some recent questions we've received regarding Applaws Natural Chicken Breast with Duck Cat Food, including answers from our team. the other flavours are 0.5% fat which suit my cat who suffers from bouts of pancreatitis. Is the chicken and duck the same? This product has a stated fat and oil content of 1%. This is still low enough to be safe for your cat I would expect, but the triggers for flare-ups of pancreatitis are not fully understood and abrupt changes in diet might also not be ideal. I would suggest introducing new foods gradually, whatever they are. Avoiding high fat foods is generally agreed as a good idea.